Chrichton's World: Review Money Monster (2016): Captivating drama forcing you to pay attention to some truth! 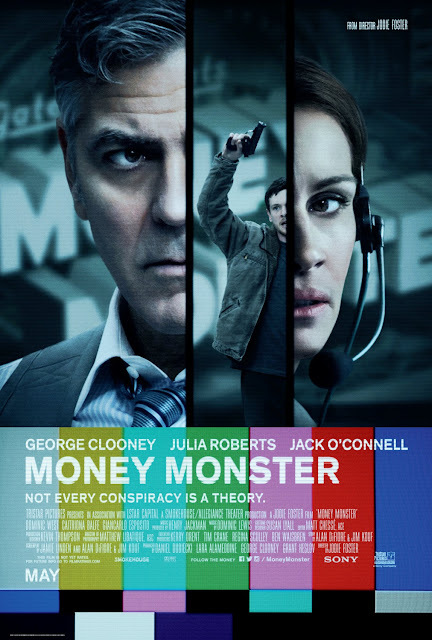 Review Money Monster (2016): Captivating drama forcing you to pay attention to some truth! Money Monster might use a simple hostage plot line to get to it's point. But it certainly is one where a lot is at stake. I read some reviews and comments on this and can't believe that a lot of people didn't like this or that they felt this was a poor thriller. Let me first start by saying that this thriller might be more conventional and isn't really about the twists and the turns. But for those people expecting those surely must not have been paying attention since it is obvious what the film is trying to say. This is about the attitude big corporations, banks and governments have when it comes to money and in particular people's money. That should worry and concern all of you. Yes, it might be political and therefore automatically boring for a certain demographic. But it's also very much a social issue that again concerns us all. Everyday we are being confronted with the practices displayed in films like Money Monster and the majority of the people seem to shake it off or console themselves by saying that as long as it doesn't do a lot of damage they will be ok. No, people, you won't be. Don't you see that is exactly the problem. We should never except these practices. It is criminal and it is wrong. Even if they would steal just a dime we should be in uproar. I don't care if you are right or left, this will concern all the people except for the very powerful and the extremely rich. Anyways back to the film. Through the hostage situation we are confronted with a certain financial loss and basically the hostage taker wants to get to the bottom of it. And while I don't entirely agree with his method I was on board with finding out the truth. It was fun to watch Clooney who starts out as a selfish prick turn into someone who does give a damn. I am not a big fan of Julia Roberts but she was actually quite good in this one. Not that she ever was bad but I never have been truly impressed by her acting. Jack O' Connel was the real surprise here as he did manage to evoke sympathy while still going through a range of emotions that did not always made him likable. But he was able to channel guilt, desperation and a sincerity all at once. He basically is everyman who is fed up and wants to do something about it. Dominic West is deliciously evil. His bad guy routine is laid on very thick yet he still manages to be charming. Even when you know how it is going to end there are still some small surprises here and there to keep you on your toes. Director Jodie Foster does a good job of maintaining tension and suspense. But the strongest elements are the scenes where the actors have to bring the drama without going overboard. A lot of the acting happens with the eyes and gestures and less with dialogue. Another good thing is that while the film is a serious affair it has allowed a lot of comic relief. There will be many times you will find yourself laughing at the absurdity of some situations. Overall this is a film that is gripping and captivating if you have any sense of what is going on in the world. If for some reason that doesn't interest you Money Monster does have some magnificent performances for you to be enjoyed.